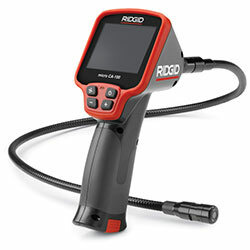 Make inspection and documentation easy with RIDGID’s next evolution of micro inspection cameras. They feature a comfortable pistol-grip design and crisp color LCD screens. The rugged anodized aluminum camera head has a scratch-resistant sapphire lens and four adjustable super-bright LED lights. Real-time image rotation ensures easy assessment of any situation. When properly assembled, camera head and cable are waterproof (IP67) up to 10 feet. The CA-100 is a cost-effective no-frills option for inspection of tight spaces. It’s ideally suited for viewing live images via the onboard 3.5" color LCD screen. For remote viewing, just connect the camera to a television/monitor with the included 3' RCA cable. Includes: CA-100 camera with 3' flexible cable and 17-mm imager head, 3' RCA cable, accessory pack (mirror, hook and magnet attachments) and four AA batteries.